As today’s business world becomes ever-more global and virtual, executives and managers are expected to work harmoniously together with counterparts from a broad array of cultures and backgrounds, often without leaving their desks. But when you throw people together who come from starkly different backgrounds and cultures, the result can be interesting, even sometimes funny, but can also lead to misunderstanding and confusion. In this seminar, Professors Erin Meyer (author of The Culture Map) and Paul Saunders offer a highly practical and timely perspective on one of today’s most pressing business issues: how do different cultures influence the way to do business when working globally? Even those who are culturally informed, travel extensively, and have lived abroad often have few strategies for dealing with the cross-cultural complexity that affects their team’s day-to-day effectiveness. This KMC provides a new way forward with vital insights for working effectively with one’s counterparts in the new global marketplace. This seminar will help you build a more cohesive and successful team: one that will work together to bridge gaps, transform differences into assets, and ultimately grow your business. To improve your own ability to communicate, influence, build trust, and negotiate deals with those from a wide variety of cultural backgrounds. To analyze the positioning of one culture relative to another on a series of behavioral scales, so that you can decode how culture is influencing your international collaboration and develop strategies for working successfully across the world. Gain a more open outlook: Improve your communication across different cultures. Create more influence across borders: Build the confidence to influence clients, suppliers and colleagues from a variety of countries. Enhance your ability to adapt: Benchmark your individual management style against preferences from around the world – and learn to adapt accordingly. Lead across cultures: Motivate and Manage performance of team members from a variety of world regions. Negotiate better deals: Increase your ability to build trust and negotiate effectively with collaborators from other countries. Whether in Düsseldorf or Dubai, Brasilia or Beijing, New York or New Delhi, we are part of a global network – not just in the office or meetings – but virtually, through e-mail, video conferences, Skype and phone. Success depends on the ability to navigate through the different cultural realities of how people think and get things done. Global team leaders who manage the collaboration of team members located across the world. Business development and sales and marketing experts who negotiate deals and sell products to clients in other countries. Senior managers currently (or about to be) posted abroad. Managers in charge of international outsourcing activities, international sales, or cross-border M&As. 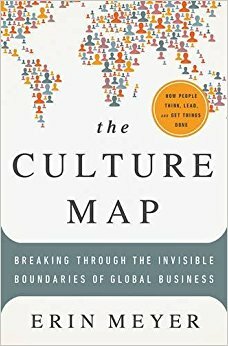 Each evening during the KMC you will be given a small amount of reading from the book The Culture Map: Breaking Through the Invisible Boundaries of Global Business. This book will be handed out in class.